Whether a tree that would provide good lumber has fallen in your yard or you need to take some trees down to build a structure, you can mill your own lumber using simple and inexpensive tools. Milling lumber is hard work regardless of the tools you have and takes time and a certain amount of strength. However, people have been milling lumber by hand for thousands of years, and both the process and the product can be extremely rewarding. Remove all branches from the felled tree, cutting as close to the trunk as possible. You can use a handsaw, a chainsaw or even pruners for smaller branches. 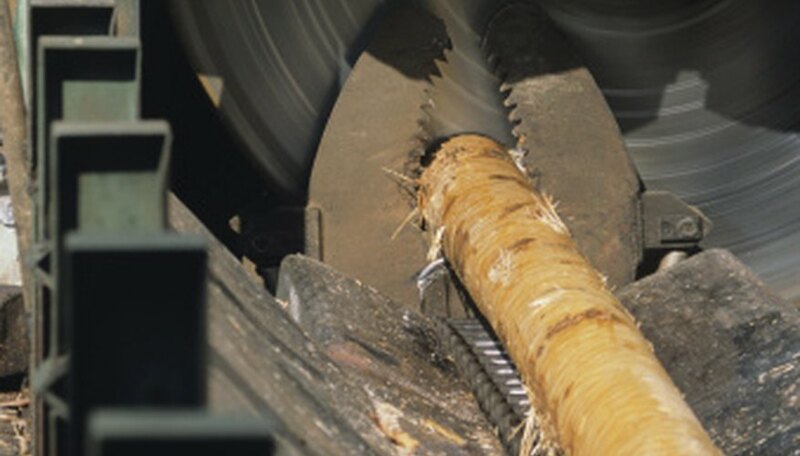 Crosscut the tree into manageable sections, 8-foot logs are a good length for your first time milling. Remove the roots and the top of the tree. You can use these ends and the discarded branches for firewood. Use the sledgehammer to pound the wood splitting wedge into the end of one of the 8-foot logs. Continue hitting the wedge with the sledgehammer until you have split the log into two pieces. Decide how thick you want your lumber to be. If you want 1-inch lumber, place the wedge parallel to your last split, 1 inch to the side. Use the sledgehammer to split off a 1-inch board. Continue until the log is completely split into boards of your desired thickness. Seal the ends of each board with wood sealant or latex paint. Stack the boards with several 2-inch-by-4-inch pieces of wood between each layer, and spaced between each board. You want air to flow freely, allowing each board to dry evenly. You also want the stack to be weighted down to keep the boards from warping or cupping as they dry. Cover your lumber loosely with a tarp and allow it to age for one year. If you plan to use the finished lumber for an indoor project, move it indoors and allow it to dry, properly stacked, for another month or two. Use a saw to rip a clean cut on the side of each board, removing the bark. Use a planer and a jointer to square off and finish your lumber. Wear proper safety equipment, including goggles. Have someone show you how to use each tool before trying them on your own. Alexander Portnoy is a writer, editor, designer and builder who has worked on books, journals and websites since graduating from Hampshire College with a B.A. in 2002. Portnoy specializes in articles on art, architecture, woodworking, construction, sustainability and science.